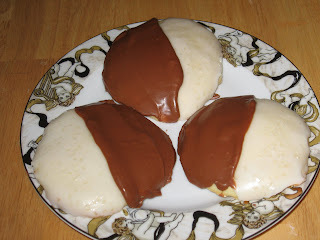 I made the famous Black and White cookies that Philina told me about and they turned out pretty good, if I do say so myself. I used Martha's recipe with a few of my own changes and some more changes for next time. I would add a little lemon zest to the cookie dough and make the chocolate frosting with a darker chocolate...I also discovered that you should add a little water and a little more corn syrup when you add the chocolate to keep it shiny. I put some sugar sprinkles on the white frosting to try to make it look Christmasy, but I don't think it is necessary. It would look very classy with some silver or gold balls down the center. This was a fun project that I think I will have to repeat and play with soon. I think you could make the white frosting pink and maybe swirl a heart in the center for Valentines Day...Oh the ideas keep going from there. 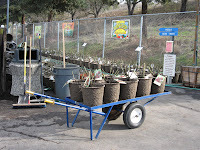 Here is the last cart of roses ready to be put away and tipped and sprayed. The roses seemed to go pretty fast this year even though we had less people working on it. I guess because it didn't rain much and make us stop. Of course, Michael and Jim may not agree...it may have seem like a neverending process to them. They were troopers and constantly tried to keep us all on task to get the job done. Next is the fruit trees that will be coming in next week...now that is when the really hard labor begins...the roses were just a warm up! Now the roses are tucked all snug in their beds. All watered in and sprayed and waiting for spring to push out their leaves and open their buds and surprise us all with their beauty and grace. I can't wait! The last catch of the year!